A good home cook, like a good restaurant chef, starts with the best ingredients. Source local for fresh products free from unnecessary additives. Local can mean your neighborhood farm, winter farmers market or delivery through Consumer Supported Agriculture. It might take a bit more time to find fresh, but the benefit is delicious. Bread is the stuff of life, but consider the artisanal loaf as the Right Stuff. Chewy crusts and bubbly textures inside speak of natural fermentation. Real bread is the flavor of nutty whole grains. Dane Percy bakes beautiful, whole-grain, artisanal loaves onsite at Brookford Farm in a wood-fired oven. He uses mostly non-GMO grains from Europe, grown in Brookford’s fields in a sustainable manner. Breads are available at the Brookford farm store, as a CSA option or at the Concord Co-op on Tuesdays. Originally, building a wood-fired oven for baking breads was just an extra feature for Noah Elbers’ farm operation in East Alstead. Now baking artisanal bread is his career. A new imported oven from Spain aids production for his everyday and specialty breads that vary with the day. Elbers uses all organic flours for his breads that are sold in markets all over southwestern New Hampshire, Vermont, CSA farms, as well as restaurants like The Restaurant at Burdick’s in Walpole and Hilltop Café in Wilton. Cheryl Holbert’s micro bakery in Derry uses simple forms and ageless techniques to combine natural wild yeasts and a slow rise to create loaves that retain moisture and taste delicious. Her breads often have global designs that reflect her love of textile weaving. She sources local wheat berries and grinds them just before mixing to ensure peak nutritive value for her levain, barbari, ciabatta and challah. Jenny and Nathan Chartier’s recipes for organic, whole-grain breads have been handed down through three family generations of bakers. At Abigail’s in Weare, they sell a selection of organic specialty breads like onion dill, sourdough and anadama, plus sticky buns. Breads are sold in many stores throughout New England, including Whole Foods Market in Nashua and UNH Dairy Bar, as well as online. Jazz musician Dan Greenspan crafts artisan bread loaves in a custom, wood-fired brick oven at his home in Richmond. It’s not like any other bread you’ll find on store shelves today and that’s the way he likes it. Greenspan produces an old Flemish loaf called desem. His whole-wheat sourdough bread is naturally leavened, and flour, water and salt are the only ingredients. He delivers his breads at stops along his weekly route to Boston and business has been flourishing. Judy and John Schneider can be found at their adorable storefront in Hillsboro, baking up their hearty German sourdough breads, original soft pretzels, crusty rolls and pastries. They use their own homemade sourdough cultures, all natural ingredients and no preservatives. They also sell at the Henniker farmers market on Thursdays. Me & Ollie’s is the family-owned business of Roger and Sue Elkus. It is named after their three sons Max, Eli and Ollie. They bake a full line of traditional American breads as well as an extensive variety of European artisan breads. Pure, natural ingredients, hand-cultured sour starters, long fermentation times and lots of love define their commitment to authentic bread. They mill their own flour in their Portsmouth bakery and deliver daily to their other café locations in Greenland, Exeter and Newington. House-made fresh pasta is available in many varieties including sheets that can be used for lasagna or your own ideas. They will also cut it to your desired width from vermicelli to fettuccine. Dave Valicenti and his wife Michelle started their operation with a bumper crop of tomatoes and a “Red Gravy” operation, but added pasta making to the ledger a few years later. Now their 30 or more varieties of pasta are available frozen statewide and made with local ingredients, especially the ravioli stuffed with everything from pumpkin sage to wild garlic scape to brandied lobster. With Dave’s chef background, the filling possibilities are creative and succulent. Terra Cotta Pasta varieties of flat and filled products are available frozen statewide, including ravioli with asparagus and mozzarella, black bean and cheddar, plus tortellini and potato gnocchi. Take-and-bake offerings include a roasted vegetable, seafood and traditional lasagna. Find a selection of accompaniments at their stores, including olives, salads, grilled slab pizza and more. Treat yourself by making the delicious pasta Bolognese dish at home. Look for wheat berries to grind with a manual or electric grain mill. Otherwise, the dry container for Vitamix is intended for grinding grains. For small batches you can use a coffee grinder and finish the job in a conventional blender. Brookford Farm in Canterbury grows and mills their own wheat, including a soft variety for pasta or pancakes and a hard winter wheat for breads. Or you can use a combination of both. Available at their farm store or as an add-on to their year-round CSA membership. Fresh grain and flours are available online from the Littleton Grist Mill, including buckwheat, sorghum corn meal, wheat flours and a variety of mixes. Four Star Farm in nearby western Massachusetts offers a variety of wheat berries (and hops if you make beer). Happy cattle have a home on the range. All across the state, there are producers who pasture-raise their animals. A few are large, with their own processing plants, but many are small family farms with enough stock to supply the local farmers markets or their own farm store. Get to know your local farmer. Situated just outside postcard-pretty Warner, Yankee Farmer’s Market provides high-quality, pasture-raised meats in a sustainable small farm setting. Brian and Keira Farmer (yes, that is their last name and they are proud of it) offer a full line of New England all-natural, hormone-free and antibiotic-free meat — with a specialty in buffalo. Also find locally raised, grass-fed ground beef, pastured lamb and pastured non-GMO pork, free-range chicken and turkey, plus all-natural elk and venison in their farm store. In the 1830, Miles Smith cleared the land in Loudon and built the original farmhouse. Today, the farm is operating stronger than ever under the ownership of Bruce Dawson and Carole Soule with 55 head of grass-fed Scottish Highlander and Angus cattle. They have 30 acres of fields for the Highlanders to range free, and additionally they truck animals to remote pastures where their natural hoof action helps restore the soil. Beef products, local dairy and other products can be purchased at their farm store in Loudon as well as many markets, including Hannaford, all over New Hampshire. Dana and Tiffany Briggs, the owners behind a family-run agricultural business in Sullivan, are focused on raising black Angus beef. Both grew up on dairy and beef farms and are passing down the traditional family practice to their two daughters. They created a unique Farm Pen Pal program that helps children understand how food moves from the farm to the grocery store. They sell their beef directly to the public as well as through the Monadnock Food Co-op, Hannah Grimes Marketplace, Fritz’s in Keene and many other locations. Located at the base of Mount Monadnock in the tranquil southwestern corner of New Hampshire, Dave and Sally Adams and their children have been running the East Hill Farm in Troy. They sell all sorts of meats raised at their farm, like Heritage Kerry beef, pork, lamb, goat, veal, roasting chickens and roasting turkeys. Since the end of WWII, the farm has welcomed vacationing families at the farm where they can experience life up-close and participate in fun farm activities. Along the Connecticut River Valley in Winchester, Sam Canonica and Sarah Costa moved their animals to this old farm in 2006 to continue the farming history that existed on the land. They raise a unique dairy herd of heritage Dutch Belted cows that produce a sweet, easily digestible, super-premium milk. They also offer pasture-raised, grass-fed meats, including beef, pork, chicken and eggs. All of their farm products can be purchased at the farm store or the farmers market in Keene and select retail locations throughout the region. Chris and Caitlin Caserta are the fortunate family that is keeping this multi-generational farm in Walpole, with its signature red-and-white buildings, running smoothly year after year. In their cute farm store, one can buy their 100 percent grass-fed beef, pasture-raised chickens, turkeys, pork and eggs. The Casertas offer farm apprentices and internships to young people in order to share their knowledge and love of sustainable farming. They also distribute products to the Walpole Grocery Store, The Restaurant at Burdick’s and the Monadnock Food Co-op. Growing up in South Africa as a child and learning about the farming industry most of his life, Steve settled in Litchfield with years of global experience. His cattle are the foundation of a holistic farming system that builds fertility in the soil, treats the animals humanely and produces healthy food. They use no synthetic chemical fertilizers, pesticides or soil amendments. Today, the farm has expanded to include delicious, healthful, pastured chickens, eggs, pastured pork, 100 percent grass-fed beef and certified organic vegetables. Purchase goods at the farm store or online for pickup at the farm. Hurd Farm LLC is a 160-acre farm in operation since 1923 located on the scenic Taylor River in Hampton. These days, Steve and Sheryl Hurd, the fourth generation to farm here, raise all-natural, grass-fed beef and chickens and heritage breed pigs. Their meats and poultry are fed an all-natural diet with no added antibiotics or other additives as growth stimulants. In 1994, brothers Henry and Bruce Ahern sought to bring back 200 acres of farmland that had been in the family for three generations — their solution? Raising Red Deer. Their farm is one of three deer farms in New Hampshire and the Aherns see it as part of their mission to educate people about the benefits of venison and antler velvet. They have oven roasts, pot roasts, steaks, organ meats and sausage that can be ordered online and shipped. “Know where your meat comes from” is the tag line for this family-run beef and hog farm in North Haverhill. At PT Farm, Pete and Tara Roy are able to sell meat that is grain-finished and processed right on the farm. They have their own USDA processing plant onsite to ensure the freshest product is offered to their customers. There is also an onsite store to pick up various cuts of beef and pork, their locally smoked product line and sausage patties. In Tamworth, the Letarte family, along with their four adult children, have worked hard to create what their slogan calls “Wicked Good Food.” They produce the highest-quality beef from their selected breed of cattle, Blonde d’Aquitaine. They also grow pasture-raised broiling chickens and pigs. A new offering on the farm is farm-to-table dinners and tour evenings that feature a multi-course farm dinner experience showcasing their 100 percent organic produce and meats. A delightful way to spend an evening in New Hampshire. This rabbitry offers fresh and frozen rabbit meat, both younger and more tender “fryers,” and rabbit meat best used for stew. The animals are fed a fodder of pellets, natural greens and seeds. Pick up and local delivery is possible for both retail and wholesale to restaurants. Cheese, milk and butter from local farms are nothing like their supermarket counterparts. The animals are usually pastured and cheeses made onsite for true farmstead cheese designation. Many local hard cheeses are made from raw milk for extra nutritional value. Caterina and Luke Mahoney worked on farms in Russia and Germany, learning and practicing organic and biodynamic farming in order to bring all this knowledge to their farm in New Hampshire. They are a diversified farm and offer an array of cheeses, such as cheddar, Camembert, Coulommiers, feta and a special German cheese called quark. Deep in the hills of Gilmanton, Valerie Jarvis, her husband and their 10 children collect every drop of milk there is from their herd of 55 does, all born, bred, bottle-fed, hand-raised and then milked by the family every 12 hours, 365 days a year. Every ounce of the nearly 15,000 pounds of cheese they produce annually is hand-dipped, hand-salted and personally packaged. Using no growth hormones or chemicals, the Jarvis family sells artisanal goat cheeses like Camembert, ashed mold-ripened Valençay, and applewood-smoked buttons. On the banks of the Connecticut River, six generations of Robies have farmed the property since 1870. Lee, Betty Sue and their four sons run the dairy operation. Their cheeses: Alpine-style toma, smoked toma, delicate tangy Piermont, cheddar-type Swaledale and Swiss-style Gruyère. They are made in small batches with Robie Farm raw milk, then aged on wooden planks in the cheese cave right there on the farm. They sell their cheeses at their own farm store, retail stores and restaurants, and can ship anywhere in the US. On their farm in Walpole, Joseph and Sonia Sawyer make cheeses using certified organic milk from a small herd of Holstein and Brown Swiss cows. Each wheel of cheese is handcrafted and aged in their cheese cellar. Joseph studied with cheesemakers in New Hampshire as well as with a number of Spanish cheesemakers to create their own artisanal line. Their flagship cheese is called Ver-Hampshire, and one may find a selection of cheeses infused with red peppercorn, black peppercorn, organic lavender flowers or caraway seeds. Sawyer’s cheeses are distributed widely all over New England. This dairy-based farm, close to the fertile banks of the Connecticut river in picturesque Walpole, is continuing two and a half centuries of farming tradition by the Cabot family. As long as anyone can remember, there was a dairy farm on this site. Today, Stephanie Cabot and Marcus Lovell Smith carry on the family farm heritage by producing three raw milk Alpine and “cave-aged” cheeses: smoked and unsmoked baby Swiss and semi-aged, nutty fiddlehead tomme. Cheeses can be ordered from their farm store, directly from their website, and from many stores throughout New England. There is a small farmstead cheese company nestled in the rolling foothills of the White Mountains in Landaff, part of the Ammonoosuc River Valley. Owners Doug and Debbie Erb grow their own feed for the cows milked at their dairy farm, Springdale Farm, next door. Landaff cheese is an authentic New Hampshire cheese based on a traditional Welsh recipe. They named their mild, semi-firm, buttery cheese Landaff in honor of the town’s connection to Bishop Landaff of Wales. Luckily for cheese lovers, their cheese can be purchased directly from their website. Providing a fresh wholesome local product by using the most efficient and environmentally sound practices is the promise of this creamery. The Robertson family of Bohanan Farm raise the cows that provide all the fresh milk used in their line of cheeses: aged cheddar, maple smoked cheddar, garlic cheddar and jalapeño cheddar. Their local cheese, cream and milk can be found at farms and markets all over New Hampshire as well as many Hannaford grocery stores. This diversified farm in Wilton proudly wears the title of “Oldest continuously operating CSA in the US.” Under the guidance of master cheesemaker Benjamin Meier, cheeses are produced and aged right at the farm. Grass-fed raw milk from their select herd of Ayrshire and Jersey milking cows is the basis for all their farmstead cheeses — Roquefort, Edam, Jarlsberg, goat’s milk Gouda, farmstead cheddar, Monterey Jack, Muenster, Manchego Swiss, tomme, Gruyère, sharp cheddar and Parmesan. They can be purchased from their farm store Monday-Saturday. The Taylor farm was founded in 1970, but the Taylor family has called New Hampshire home since 1896. Until 2009, all of the farm's milk was shipped to their cooperative, becoming a part of the line of Agri-Mark products. While much of the milk produced is destined to be turned into Cabot butter, they now reserve a small portion to bottle their whole, creamline milk, and to make a signature line of artisan cheeses. At the farm you'll also find a sugar house where they make maple syrup and other maple products. Visit the Sanders Fish Market in Portsmouth or find the truck at the Everett Arena parking lot in Concord on Fridays all year long. NH Community Seafood delivers fresh, local seafood to a variety of locations across southern New Hampshire for pickup by CSF (Community Supported Fishery) members. The fisheries are closed until May. Then the organization will sell shares for three or four different seasons during the year — each featuring varieties that are running, from monkfish to king whiting to dogfish from the shark family. Join now for as little as $40 per session. Lobster is generally available year-round, but better in the warmer months when they’re taken directly from the ocean to the fishmonger. Avoid lobsters that have been living in pounds too long. A drive to the Seacoast is the best option. Look to Yankee Fisherman’s Cooperative in Seabrook for fresh, off-the-boat lobsters and scallops. Great Bay has become a fertile ground for oyster farming. Usually best to enjoy them at an oyster bar like The Franklin Oyster House or Row 34 in Portsmouth, but competent shuckers can find local oysters at Finns Fish House in Dover, Newick’s Lobster House in Dover, On The Vine Marketplace in Exeter or directly from the oyster farmer. Season begins again in spring. Extras: Read more about where to find oysters in NH here. 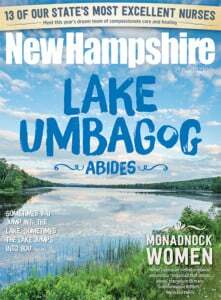 Plus, read more about the NH fishing industry here. Find just about any fish available at their Portsmouth fish market or at Concord’s Everett Arena on Fridays, 10 a.m. to 4 p.m. year-round. Pre-ordering is encouraged. (603) 436-4568. The Market is located at 367 Marcy St. in Portsmouth. Farmers markets are periodic and most winter markets are winding down now (some are open through April – see our directory here. Our Summer Markets list will be updated soon. ), but farm stores on farms that produce meats or grow a variety crops can be worth the drive. Meet the farmer, pet the cows, maybe even get your boots dirty. Most of the meats will be frozen unless you call and get their butchering schedule. Fully stocked, new store offering their own produce, apples and other locally sourced items, including NH Mushroom Company’s wide variety of fungi available year-round. Worth the trip for the onsite restaurant. Store, open daily, offers beef, chicken, pork, cellared vegetables, milk, cheeses, flour and Canterbury Bread Shop breads. A non-profit, working farm that models sustainable food networks and responsible land stewardship. Open daily year-round, offering spring and winter greens, meats, eggs, raw milk, flour, honey and maple syrup. Vegetables grown on the farm from greenhouses and storage crops available year-round, plus honey, raw milk, maple syrup, jams, cheese and eggs from local providers. Hollis store open year-round, offering their own meats, apples and bakery items in addition to local dairy and a full range of produce for the convenience of one-stop shopping. Spring salad mix with flowers is great when available. Also pick up You You’s fabulous salad dressing and other artisanal products. Why pay $5 for a dozen eggs? Simply put, eggs from pastured hens are tastier and healthier for you. They have more vitamin A, twice the omega-3 fatty acid, three times the vitamin E and seven times more beta-carotene. You can see that beta -carotene in the golden yellow yolk. And in a fresh egg, the yolks don’t break and are very perky. If you haven’t tried a really fresh egg, head to the local farmers market or stop at a roadside stand. The egg with the more yellow yolk in this photo was purchased at the Wentworth Greenhouses Winter Farmer’s Market. The other, claiming to be free-range, was from a larger commercial operation purchased at a local grocery store. Opens March 3 with foods from their kitchen and bakery. Also find fresh fish delivered by Sal’s Fresh Seafood. A selection of grass-fed Scottish Highlander and grain-finished Angus beef, sausage, pork, chicken, duck, milk and eggs and other local products are available in their solar-powered store onsite year-round. Farm-fresh eggs, beef, pork, chicken along with bedding plants will be available when their new store opens in May. Craig Thompson and Sarah Heffron grow all-natural beef, chicken, lamb, pork and turkey on their picturesque farm. With a licensed kitchen, they use their best ingredients and other locally sourced items to prepare artisanal sausage, soups, stocks, entrées and baked goods. Jeff and Liz Conrad raise sheep and goats for the meat, skins and wool. Boneless leg of lamb and other cuts of lamb and goat are for sale at the farm store, along with wool products from colorful yarn to roving to lambskins. Open every day except Wednesday and Sunday from noon to 6 p.m.
A diversified family farm offering farm-raised meats and poultry and has been in the family for 157 years. In their farm kitchen they prepare baked goods using their own eggs. All are offered in their farm store that opens in June. There are more than 100 maple sugar shacks scattered throughout the state, ready to make the syrup when Nature says she’s ready. They wait for warm days with cool nights that will let the sap flow. Visit nhmapleproducers.com to view a list of sugar shacks by county. In the height of the season, you can watch sap being boiled by wood fire or oil, and see collection methods ranging from modern plastic tubing to historic galvanized buckets at small producers or family farms. Look for steam rising. The Rocks Estate Maple Sugar House in Bethlehem is home to the NH Maple Museum. Watch tree-tapping and ride a horse-drawn sleigh. Others include 100 Acre Wood Sugar Shack, Invervale — take a wagon ride through the sugar bush or cross-country ski the trail; Parker’s Maple Barn, Mason — first-come, first-served destination restaurant, but you can amuse yourself in the gift shop; Benton’s Sugar Shack, Thornton — enjoy a pancake breakfast at their rustic restaurant; Stuart and John’s Sugar House, Westmoreland — enjoy pancakes and fritters with maple syrup at their simple restaurant; Heritage Farm Pancake House, Sanbornton — family-style breakfasts and sugar house on the farm. A new system in New Hampshire is taking effect for 2016, which helps clarify the grading system. Grade A is now Grade A Golden Delicate Taste, best for candy-making; Grade A Medium is now Grade A Amber Rich Taste, classic flavor for pancakes; Grade A Dark is now Grade A Dark Robust Taste, slightly stronger but still great for pancakes; Grade B is now Grade A Very Dark Strong Taste, best for cooking. The point is, it’s all good; it just depends on your taste and usage. Tap your own trees; equipment is available at Sunnyside Maples in Loudon. It only takes a tap, a hammer and a bucket. Just remember it takes 50 to 60 gallons of sap to make a gallon of syrup, depending on its sugar level. A single tree can produce about 10 to 20 gallons of sap. Maples other than sugar maples can be tapped, but the sap is less sweet. It is even possible to tap birch trees. Stop tapping when the buds appear. Boil outside. Make your own sugar on snow by boiling two cups of maple syrup in a very tall pot with a candy thermometer to 240 to 260 degrees. Be careful, it will foam up and be very hot. Immediately pour it into four- or five-inch strips of clean snow. You can let them harden for candy or remove and enjoy immediately as taffy.